Less than £50, that is!! I love this, I could easily slip into this to cool down on a hot summers day, a classic, timeless jersey dress that will look soo casual chic!! This dress is right up my alley. I love how casual it is but still very stylish--great find!! Oh..that's so fun. And it makes me think of much warmer weather than we have right now, too. Thank you so much for the comment. Its been sort of fun to see who is on who's side in this. Is Eric at fault or is it Ellie? Thank you so much for reading. I just figured out my first entry of the story was March 30 of last year. It makes me think of something I could even do DIY..even. As if I would get around to doing something like that. Very adorable. Adorable! Will you snap one up, Sharon? Hi everyone-thanks for the comments and Sal, although I like it, £50 is still too much for me at this time, LOL! Wow, it's gorgeous. What a find. Hi Ambika-yes, it is lovely! Hi Gigi-oh, I'll love to see you in this, can't wait my dear! O wow - I have to buy this!! Oh I like that a lot, Sharon. That's a beautiful dress even if it is summer casual. But then again, I'm all about comfort! Such a nice dress, so cute. Thanks so much for the note. Its good to hear from you. rad tunic/dress! love the print. Hi everyone-thanks for the great comments! That's really cheap for Burberry! But I would like it better if it was a t-shirt. Thanks so much for the note. I'm still thinking of trying to do some thing like this, but it might not have the same outcome as this outfit. Its adorable. Its great to have the picture to look at...for inspiration. Hi there-thanks everyone for stopping by!! ahh, i saw his (diffusion, may we call it) line a while ago and i'm in love with the silk pink dress, have you seen it? 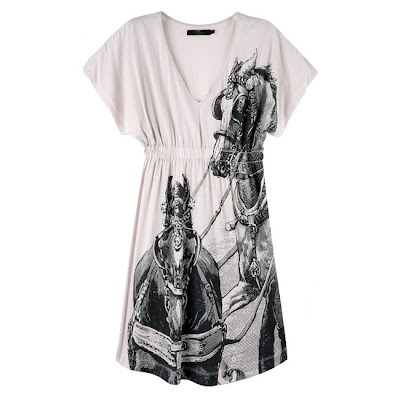 Very cute - I love clothing & accessories with "horsey" designs - even though I don't know how to ride - go figure!! Hi Rudi-I've not seen the pink dress, it sounds nice! Hi Broke Bettie-LOL, that sounds like me too! I think this is so pretty but not made for people with "real" figures. Whenever I try a design that goes across the chest area it gets distorted and I end up feeling so self conscious! I like this piece sweetie! would wear it either on its own or in a multitude of layered outfits. Hi marian-yes, it would look lovely with layers too! Hi merily-yes, I agree, thanks for stopping by!